The M-type phospholipase A2 receptor (PLA2R) is a target autoantigen in adult idiopathic membranous nephropathy (MN), but the prevalence of autoantibodies against PLA2R is unknown among Chinese patients with MN. Here, we measured anti-PLA2R antibody in the serum of 60 patients with idiopathic MN, 20 with lupus-associated MN, 16 with hepatitis B (HBV)-associated MN, and 10 with tumor-associated MN. Among patients with idiopathic MN, 49 (82%) had detectable anti-PLA2R autoantibodies using a Western blot assay; an assay with greater sensitivity detected very low titers of anti-PLA2R in 10 of the remaining 11 patients. Using the standard assay, we detected anti-PLA2R antibody in only 1 patient with lupus, 1 with HBV, and 3 with cancer, producing an overall specificity of 89% in this cohort limited to patients with secondary MN. The enhanced assay detected low titers of anti-PLA2R in only 2 additional samples of HBV-associated MN. In summary, these results suggest that PLA2R is a major target antigen in Chinese idiopathic MN and that detection of anti-PLA2R is a sensitive test for idiopathic MN. In 2002, neutral endopeptidase (NEP) was identified as the responsible antigen in a rare subset of infants with alloimmune antenatal membranous nephropathy. This discovery proved that an antigen on human podocytes could serve as the target for podocytopathic antibodies.14,15 In 2009, the M-type phospholipase A2 receptor (PLA2R) was identified as the major target podocyte antigen involved in adult autoimmune idiopathic membranous nephropathy.16,17 The initial study by Beck and colleagues showed a 70% positivity rate in a cohort of American idiopathic MN patients, consisting predominantly of Caucasians and African Americans. In this study, we explored the prevalence of autoantibodies against PLA2R in Chinese patients with idiopathic MN. Typical secondary MN cases including lupus MN, HBV-associated MN, and tumor-associated MN were chosen to confirm the specificity of anti-PLA2R for idiopathic MN. Anti-PLA2R autoantibodies in serum samples from 60 Chinese patients with idiopathic MN and >3.5 g/24 h proteinuria were examined by Western blotting using human glomerular extract (HGE; a source of native glomerular PLA2R) as the substrate. Serum samples from 49 patients (81.7%) were reactive with PLA2R, which was visualized as a 185-kD protein band. All these serum samples also recognized cell-expressed recombinant human PLA2R, which appears smaller, likely because of incomplete glycosylation in vitro (Figure 1). No other reactive bands were observed. As previously reported,16 IgG4 was the predominant anti-PLA2R reactive subclass; however, there was weaker reactivity with the other IgG subclasses in most cases. Western blot analysis of representative serum samples from patients with idiopathic MN demonstrates reactivity with native and recombinant PLA2R. Extracts of HGE and recombinant human PLA2R (rPLA2R) were electrophoresed under nonreducing conditions and immunoblotted with patient serum (IMN1 through IMN4) at 1:25 and detected with anti-human IgG4. IMN1, IMN3, and IMN4 recognize PLA2R in HGE and the smaller cell-expressed rPLA2R. The recognition was confirmed using commercial polyclonal anti-PLA2R antibody. IMN2 in this figure is negative. No other reactive bands were observed. M. Protein standard (kD). PLA2R is heavily glycosylated and treatment with peptide N-glycosidase F causes a shift in its mobility to approximately 145 kD.16,18 As previously shown in the American cohort,16 the anti-PLA2R antibody in Chinese idiopathic MN patients could also recognize the deglycosylated PLA2R (Figure 2). Idiopathic MN sera react with glycosylated and deglycosylated PLA2R. Native PLA2R in HGE is heavily glycosylated and treatment with peptide N-glycosidase F (PNGaseF) caused a downward shift to approximately 145 kD. The anti-PLA2R antibodies from patients IMN1, IMN3, and IMN4 recognized the deglycosylated as well as the native PLA2R. M. Protein standard (kD). To determine if the remaining 11 patients had any evidence of anti-PLA2R autoantibodies below the level of detection of our standard Western blot protocol, the dilution of serum sample was decreased to 1:10, the HRP-labeled secondary antibodies were increased to 1:3000, and the exposure time was increased to 10 minutes. Low titers of anti-PLA2R could be detected in 10 of these 11 patients. The strength of the band was much weaker on Western blot than that of a representative positive serum (defined as such using the standard assay) diluted to 1:1000 (Figure 3). No low titer of anti-PLA2R was detected in healthy controls (n = 20). Increasing the sensitivity of the western blot assay reveals low titers of anti-PLA2R in initially negative idiopathic MN sera. Representative examples of immunoblots of HGE with two idiopathic MN sera that were negative under standard conditions (IMN2 and IMN8) but became positive when the dilution of serum sample was reduced to 1:10 and the exposure time was prolonged to 10 minutes. PC is a MN serum that was positive under standard conditions and is diluted to 1:1000 for this experiment. The downward shift in the size of the reactive band could be observed after PNGaseF treatment. HC, healthy control, serum from healthy adult (1:10). M. Protein standard (kD). We compared the intensity of glomerular immunostaining for IgG4 in five patients with high and five patients with low titers of IgG4 anti-PLA2R. Although IgG4 was present in the glomeruli of all anti-PLA2R–positive cases, the intensity did not correlate with the titer of circulating antibodies (Supplemental Table 1). During the follow-up of 60 patients with idiopathic MN (Supplemental Table 2), one patient without anti-PLA2R went into complete remission after treatment for 3 months. In 10 patients with low titers of anti-PLA2R, 5 patients (50%) went into remission within 1 year of treatment and developed no relapse. In 49 patients with high titers of anti-PLA2R antibodies, 15 patients (30.6%) went into remission without relapse. The average time to remission (14.47 ± 7.62 months) was longer than that of patients with low titers of anti-PLA2R (6.60 ± 3.58 months). These results suggested that patients who had low levels of anti-PLA2R antibodies were prone to developing remission within a shorter period of time (P < 0.01). Anti-PLA2R reactivity was examined in serum specimens collected from 21 additional idiopathic MN patients who had entered a clinical remission after treatment. Anti-PLA2R was negative in 17 (81.0%) patients using the standard method. Low titers of anti-PLA2R were detected in 7 patients using the enhanced sensitivity assay (Supplemental Table 3). However, it is not known how many of these 21 were positive to start with. If we assume a similar proportion (>80%) of these patients were anti-PLA2R–positive at the time they were initially nephrotic, these results suggest that the presence of anti-PLA2R in idiopathic MN patients is associated with the disease activity and, conversely, that the autoantibodies decrease or disappear in remission (Figure 4). Two of the patients with high titers of anti-PLA2R antibodies relapsed 6 months after remission. 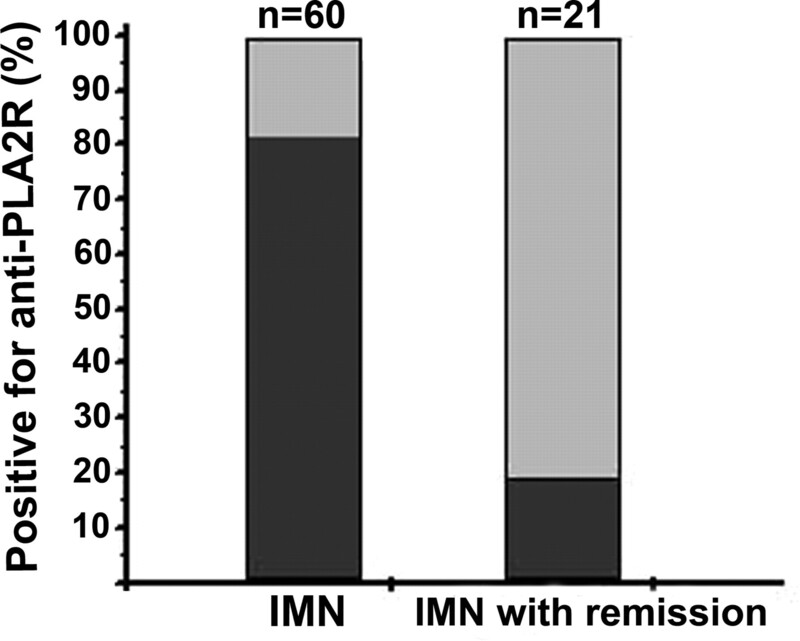 The prevalence of anti-PLA2R in idiopathic MN (IMN) in remission is low by comparison to IMN patients with nephrotic syndrome. The prevalence of anti-PLA2R seropositivity was compared in the 60 patients with nephrotic syndrome to 21 additional patients in remission (see Supplemental Tables 2 and 3 for details), using the standard assay. Although anti-PLA2R could be detected in most of the patients with idiopathic MN, anti-PLA2R was largely negative in patients with secondary causes of MN including lupus, HBV, and tumor-associated MN (Table 1, Figure 5). Anti-PLA2R is detected infrequently in secondary MN. The dark bars represent the prevalence of anti-PLA2R detected in patients with idiopathic (IMN), lupus-associated (LMN), hepatitis B—associated (HBV-MN), and cancer-associated (Ca-MN) membranous nephropathy, using the standard Western blot assay. In the serum samples from 20 patients with lupus MN, only one sample contained anti-PLA2R antibodies. No low titers of anti-PLA2R could subsequently be detected in the negative patients using our more sensitive Western blot protocol. 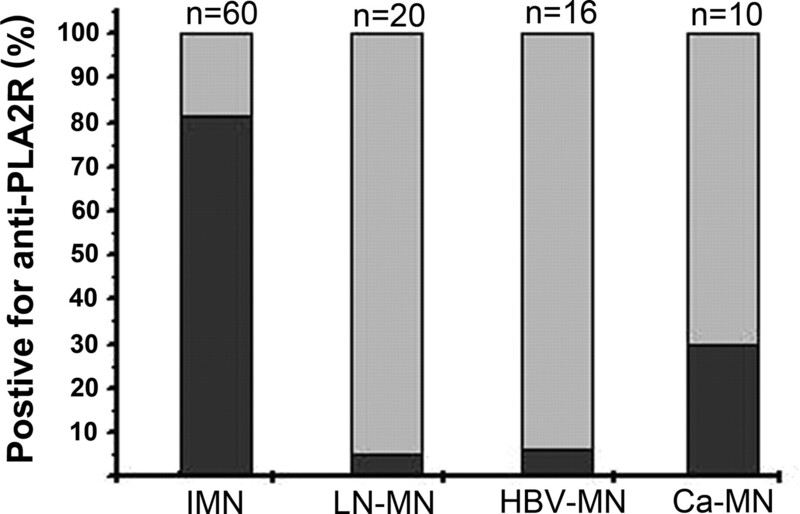 Similarly, only 1 of 16 HBV-associated MN samples was found to be positive. Low titers of anti-PLA2R were detected in 2 of the 15 HBV-associated MN samples initially considered negative by the standard method. IgG4 was the predominant PLA2R-reactive subclass in these cases, whereas testing for reactivity with IgG1, IgG2, and IgG3 did not disclose any additional cases of secondary MN with anti-PLA2R. Nor did we observe any other bands. Interestingly, obvious IgG4 immunostaining in glomeruli was observed in the lupus MN and HBV-associated MN patients that had detectable circulating anti-PLA2R antibodies, including the two patients with low titers of anti-PLA2R. However, there was no IgG4 immunostaining in those patients without anti-PLA2R antibodies (Figure 6). During the follow-up, none of the HBV-MN patients with anti-PLA2R (including the two with low titers) entered into remission after antiviral therapy, whereas most of the other patients without anti-PLA2R developed complete remission after such treatment (Supplemental Table 5). Staining for IgG4 deposition in glomeruli of secondary MN patients distinguishes those with circulating anti-PLA2R from anti-PLA2R-negative cases. 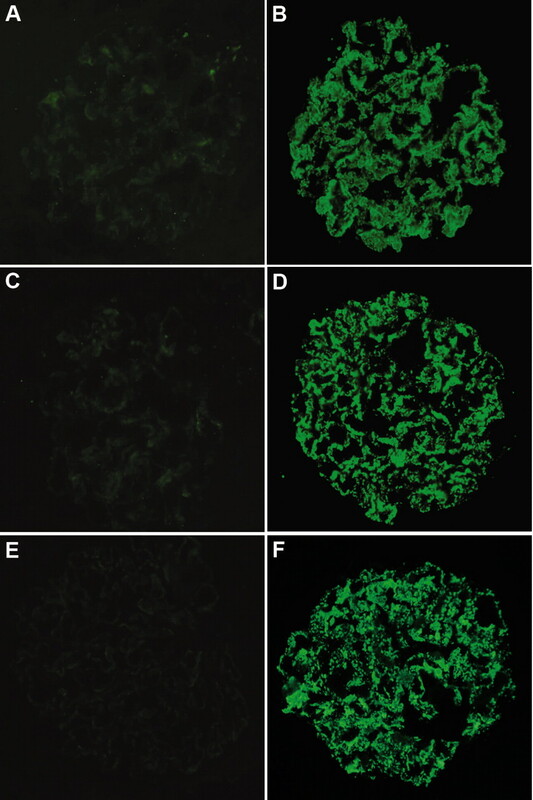 (A,C,E) Negative immunostaining for IgG4 in glomeruli of patients with lupus-MN (A), HBV-MN (C), and tumor-associated MN (E) but without circulating anti-PLA2R antibodies. (B,D,F) Bright IgG4 immunostaining in glomeruli of patients with lupus-MN (B), HBV-MN (D), and tumor-associated MN (F) whose circulating anti-PLA2R antibodies were positive. A higher proportion of the 10 patients with MN associated with solid tumors were found to have anti-PLA2R antibodies. Anti-PLA2R was negative in 7 patients but positive in the other 3 patients. No low titers of anti-PLA2R were further detected in the negative patients. Interestingly, the strength of the IgG4 signal by immunofluorescence in the immune deposits was quite different between these two groups of patients with cancer. Moderate IgG4 deposition in glomeruli was observed in 2 of 3 patients with circulating anti-PLA2R antibodies (with trace deposition in the third), but the staining for IgG4 in glomeruli was negative in the 7 patients without circulating anti-PLA2R antibodies (Figure 6). The clinical data for the 10 tumor-associated MN patients are listed in Supplemental Table 6. Proteinuria manifested before or at the time of diagnosis of malignancy in 9 patients. The tumor was asymptomatic and recognized by systematic diagnostic procedures triggered by the diagnosis of MN. In one patient, MN was diagnosed 6 months after the diagnosis of lung cancer. During follow-up, all three patients with anti-PLA2R autoantibodies had persistent or relapse of proteinuria despite resection of the tumor. In those patients without anti-PLA2R autoantibodies, complete remission of the proteinuria was seen in two patients after tumor resection; three patients died of cancer; the remaining two patients had persistent proteinuria without tumor resection. Membranous nephropathy is one of the most common glomerulopathies worldwide. We set out to determine the sensitivity and specificity of circulating anti-PLA2R autoantibodies in a Chinese cohort with MN. For the remaining idiopathic MN serum samples from the 11 patients in whom anti-PLA2R was undetectable by the standard method, the sensitivity of the immunoblot assay was enhanced by increasing the concentration of patient serum and HRP-labeled secondary antibody and prolonging the exposure time on films. Very low levels of anti-PLA2R antibodies were detected in 10 samples. These results indicated that anti-PLA2R autoantibody existed in nearly all of the 60 idiopathic MN patients. On the other hand, anti-PLA2R antibodies were mostly negative or at low levels in idiopathic MN with remission after treatment. Our results showed that 10 of 21 such patients were negative whereas 7 others had only low titers of anti-PLA2R. These results suggest that the presence of high-titer anti-PLA2R in idiopathic MN patients is associated with the disease activity and that a significant portion of individuals have lost anti-PLA2R reactivity when they are in clinical remission. However, the patients in remission were prone to relapse if their anti-PLA2R antibodies were in high titers. The formation of subepithelial immune complexes is thought to occur by the following potential mechanisms. Subepithelial immune complexes may be formed in situ through the reaction of circulating autoantibody to a native podocyte antigen.25,26 Antibodies in the circulation may secondarily interact with non-native antigens artificially planted in the subepithelial space because of a biophysical or immunologic affinity for GBM structural elements.17,27,28 The high prevalence of anti-PLA2R antibody that has been demonstrated in idiopathic MN and the fact that PLA2R is expressed by the podocyte suggest a process in which the in situ subepithelial immune complex deposits mechanism is involved.16 Typical secondary MN cases, which may exhibit different pathophysiologic mechanisms of immune complex deposition, were used to explore the specificity of anti-PLA2R antibody for idiopathic MN. Anti-PLA2R antibody was negative in most cases of secondary MN except in one patient with lupus and one with HBV. Interestingly, IgG4 immunostaining in glomeruli could be observed in lupus MN and HBV-associated MN patients with high- or low-titer anti-PLA2R antibodies whereas there was no IgG4 immunostaining in those patients without anti-PLA2R antibodies. Furthermore, HBV-associated MN patients with either high- or low-titer anti-PLA2R antibodies did not enter remission after antiviral treatment whereas most of the other patients without anti-PLA2R developed complete remission after antiviral therapy. Given the high prevalence of HBV disease in China, it is highly possible that these few patients represent a coincidental occurrence of the two disease processes. Anti-PLA2R antibody was also negative in tumor-associated MN except in three MN patients with cancer of lung, larynx, and stomach, respectively. It is very interesting that the degree of IgG4 deposition in glomeruli of these two groups is quite different. In the few anti-PLA2R–positive patients with tumor-associated MN, moderate immunostaining of IgG4 in glomeruli could be observed. However, the IgG4 deposition in glomeruli was negative in the patients without circulating anti-PLA2R antibodies. The clinical follow-up of these two groups of patients also showed important differences. Those patients with anti-PLA2R autoantibodies had persistent proteinuria or relapse of proteinuria after resection of the tumor, suggesting that the two processes were not causally related. In contrast, in several patients without anti-PLA2R autoantibodies, complete remission of the proteinuria could indeed be observed after tumor resection and, in others, the proteinuria persisted in the absence of tumor resection. Additionally, >50% of the idiopathic MN patients were aged 40 to 60 years, which is also an age group with a high frequency of tumors.29–31 Therefore, it is highly possible that coincidence of idiopathic MN and cancer occurred in those tumor-associated MN patients with anti-PLA2R antibodies. More studies in this area are needed to resolve this question. In conclusion, our research suggests that anti-PLA2R is a specific marker of idiopathic MN in Chinese patients. It also indicates that there is a common pathophysiology among patients with idiopathic MN from the three population groups studied to date: those of Caucasian, African, and Han Chinese ancestry. Establishment of anti-PLA2R as a sensitive biomarker may provide new tools for diagnosis, disease activity monitoring, and design of new antigen-driven therapeutic strategies in MN. Membranous nephropathy in all cases was diagnosed by renal biopsy at the Research Institute of Nephrology, Nanjing University School of Medicine (Nanjing, China). All patients including primary and secondary MN had >3.5 g/24 h proteinuria. The diagnosis of idiopathic MN was established by the following criteria. Urinary protein was >3.5 g/24 h (Supplemental Table 2). Immune and electron-dense deposits were present exclusively in a subepithelial location, with an absence of deposition in subendothelial or mesangial regions. No glomerular infiltrating cells or proliferation of mesangial and endothelial cells were present. Immunofluorescence demonstrated that IgG was deposited in a granular pattern along the glomerular capillary walls in association with C3. No patients had evidence of secondary features, such as antinuclear antibodies, anti–double-stranded DNA, antinuclear ribonucleoprotein, anti-Smith, anti-Ro (SSA), anti-La (SSB), antitopoisomerase I (anti–Scl-70), anti–Jo-1 antibodies, anticardiolipid antibodies, antithyroglobulin antibodies, serum HBV antigens and antibodies, HCV antibodies, HCV RNA, tumor markers, or exposure to toxic agents. Lupus MN was diagnosed on the basis of clinical diagnosis of SLE with at least four American Rheumatic Association criteria (Supplemental Table 4). Renal pathology showed a membranous pattern of injury without mesangial hypercellularity or endocellularity. Immunofluorescence showed primarily subepithelial granular deposits. Urinary protein was >3.5 g/24 h and urinary red blood cells were less than 1 × 106 per ml. HBV-associated MN was diagnosed by the following criteria. Hepatitis B serology tests and HBV DNA results were positive (Supplemental Table 5). HBeAg staining was positive on frozen sections. Urinary protein was initially >3.5 g/24 h.
Tumor-associated MN was diagnosed in 10 patients at the time of kidney biopsy. Most of these patients presented with proteinuria (>3.5 g/24 h) (Supplemental Table 6). Various types of solid tumors were present, including cancer of lung (five cases), stomach (two cases), colon (one case), larynx (one case), and tongue (one case). Serum samples were collected from patients with idiopathic MN (n = 60), lupus MN (n = 20), HBV-MN (n = 16), and tumor associated MN (n = 10), which were approved by the institutional review board of Jinling Hospital. Serum samples from 21 idiopathic MN patients in remission (urinary protein <1.0 g/24 h) after treatment were also collected (Supplemental Table 3). Serum samples from 20 healthy volunteers were used as controls (Supplemental Table 7). Kidneys from deceased donors, which were unsuitable for transplantation, were obtained from the New England Organ Bank. HGEs were prepared as previously reported.16 Briefly, glomeruli were collected using a series of graded sieves and resuspended in an equal volume of 100 mM Tris (pH 8, 1 mM MgCl2) and freeze-thawed at −80°C. An equal volume of RIPA buffer (50 mM Tris-HCl, pH 7.4, 150 mM NaCl, 1% NP-40, 0.5% sodium deoxycholate, 0.1% SDS; Boston BioProducts) was added with Protease Inhibitor Cocktail Set I (Calbiochem/EMD Chemicals, Inc.) and homogenized on ice. RIPA-insoluble debris was removed by centrifugation. Contaminating human IgG was removed with Immobilized Protein G Plus (Fisher Scientific). N-linked carbohydrates were removed with peptide N-glycosidase F (PNGase F; New England Biolabs) in the absence of reducing agent. A plasmid vector containing full-length human PLA2R under the control of the cytomegalovirus promoter was transiently transfected into HEK293T cells. Cells were collected after culture and lysed with Tris buffer plus protease inhibitors. Insoluble cell debris was discarded after centrifugation. Western blotting was performed as reported.16 Briefly, HGE or recombinant PLA2R was electrophoresed under nonreducing conditions and transferred to nitrocellulose membranes. Membranes were blocked with 5% milk and then incubated with human serum at a dilution of 1:25. Sheep antibodies against human IgG4 (1:3000, Binding Site) were used as a secondary antibody. Donkey anti-sheep peroxidase-conjugated antibody was used as the detecting antibody at 1:5000 (Jackson ImmunoResearch). A commercial antibody to human PLA2R (Sigma-Aldrich) was used at 1:400 to confirm the position of the PLA2R bands. Blots were incubated in chemiluminescent substrate (100 mM Tris, pH 8.5, 250 mM Luminol, 90 mM p-coumaric acid, hydrogen peroxide) for 3 minutes and exposed to HyBlot CL autoradiography film (Denville Scienctific, Inc.). The exposure times were typically 10 to 30 seconds for positive bands and up to 10 minutes for weak or negative bands. The film was developed using a Kodak X-OMAT 2000A processor. Cryosections of kidney biopsy specimens were prepared. The slides were blocked with 10% fetal calf serum. Mouse anti-human IgG4 monoclonal antibody (Sigma-Aldrich), diluted at 1:400, was used as the primary antibody and incubated for 2 hours. After the slides were rinsed with PBS for 5 minutes, the FITC-labeled rabbit anti-mouse IgG secondary antibody (1:50; DAKO) was added and incubated for 30 minutes. The slides were dried and sealed with glycerin for observation by a fluorescence microscope. Data are presented as mean ± SEM. The t test was used for comparisons between two groups. L.H.B. and D.J.S. report having a patent pending for a diagnostic immunoassay to detect anti-PLA2R autoantibodies in membranous nephropathy. L.H.B. and D.J.S. have received consulting fees and research support from Questcor Pharmaceuticals, Inc. D.J.S. has received consulting fees from Taligen Therapeutics, Inc. This work was carried out in the laboratory of Drs. David Salant and Laurence Beck, Jr., at Boston University Medical Center and was supported by NIH grant DK 30932 (to D.J.S.) and an award from the ASN/Halpin Foundation (to L.H.B.). The authors would especially like to thank Dr. Gérard Lambeau (Institut de Pharmacologie Moléculaire et Cellulaire, Valbonne, France) for providing the full-length human PLA2R cDNA used in these studies. Genetic Variants in Membranous Nephropathy: Perhaps a Perfect Storm Rather than a Straightforward Conformeropathy?